Our web site is always under construction to provide you with the most up to date and recent promotions we offer. We are making an effort to present you with our entire spectrum of offers as soon as possible. 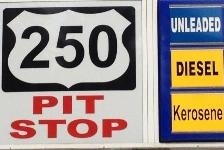 The emphasis of our site is on providing you with up to date information about 250 Pit Stop. This topic is certainly of interest to you. Check this site later, please. Our company was established in 2010 and has been responsible for providing outstanding products and services ever since. Our specialty is in the areas of fuel, food products, and c-store items. Our regular customers particularly value our professional and curtious staff. Our business is located at 73122 Pleasant Grove Road, Dillonvale, Ohio 43917.